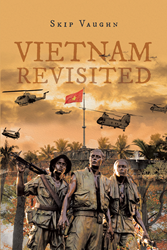 Recent release “Vietnam Revisited” from Page Publishing author Skip Vaughn is an engrossing account on the inspiring stories of veterans during the Vietnam War, their lives fifty years after being drafted, and how American citizens treat them throughout the years. Skip Vaughn, an award-winning newspaper journalist in Huntsville, Alabama, has completed his new book “Vietnam Revisited”: a compelling compilation of anecdotes detailing the heroic and commendable experiences of Vietnam War veterans as they fought the battle bordering life and death. Published by New York City-based Page Publishing, Skip Vaughn’s meaningful narrative exemplifies the conflicts faced by the veterans in the battlefield and in their own homeland, and how they and the country dealt with such uproar because of apprehensions. Readers who wish to experience this enlightening work can purchase “Vietnam Revisited” at bookstores everywhere, or online at the Apple iTunes store, Amazon, Google Play, Kobo, or Barnes and Noble.